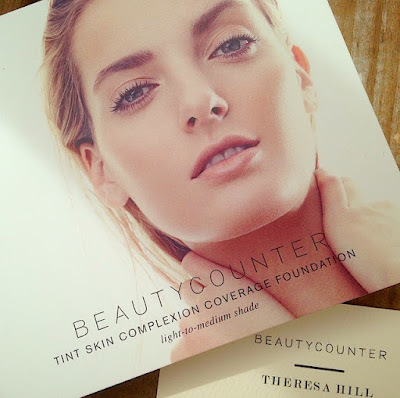 As you know, Beautycounter recently launched a limited run of products at Target (more on that in a bit). For some of you, this may be your first exposure to the brand, which bans over 1,500 ingredients with known links to hormone disruption, allergies and cancer from their products. 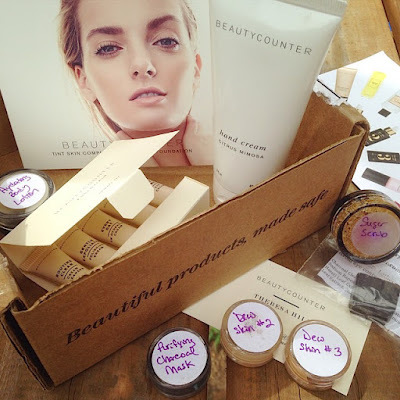 I first learned about Beautycounter via Emily Schuman of Cupcakes & Cashmere, when I asked her about her favorite natural beauty brand. I later started seeing more and more reps popping up on Instagram. One particular rep, Theresa Hill, was kind enough to send me all these products to try. I'm especially impressed because in addition to the usual skincare sample set, she made up samples from her personal stash and even sent me a full-size hand cream. Speaking of the hand cream, I'm so glad it's the full-size product, as it is my fave. It smells amazing, very similar to the Coola sunscreen in citrus mimosa that I buy all the time. It's no surprise that this hand cream is also citrus mimosa scent (it also comes in rose neroli), which is created by a combination of orange oil, mandarin orange oil, tangerine oil, lemon oil and mimosa extract. 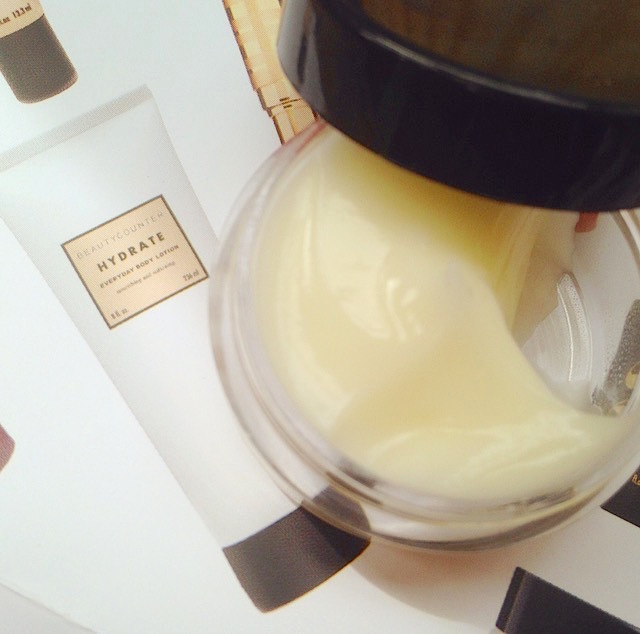 This hand cream is lightweight, yet it's extremely moisturizing. Shea butter, aloe and vitamin E hydrate and soften hands, quickly absorbing and penetrating deep into your skin. It doesn't just sit on top of your skin until you wash it away like some natural hand creams do. I highly recommend this one. 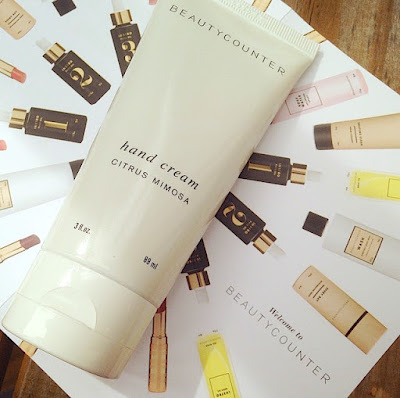 Although I have used this cream on the rest of my body, Beautycounter does make a Hydrating Body Lotion in Citrus Mimosa, as well as an Enrich Body Butter (and if you are into body oils, there also is a Body Oil in Citrus Rosemary and a Lustro Shimmer Oil; you know how I love shimmer). Theresa sent me a sample of the body lotion, as you can see here. The lotion is sheerer and a bit lighter than the hand cream in both texture and scent. This moisturizing blend of marula, mongongo and safflower seed oil, along with shea and jojoba butters easily glide across your skin and absorb quite nicely. The best part is that a little goes a long way. Thanks to Theresa for sending me a sample of the Sugar Body Scrub in Lemongrass, I was able to give my skin an extra treat. It's so pretty and sparkly, with a refreshing and relaxing scent. I can see why this is a best seller. 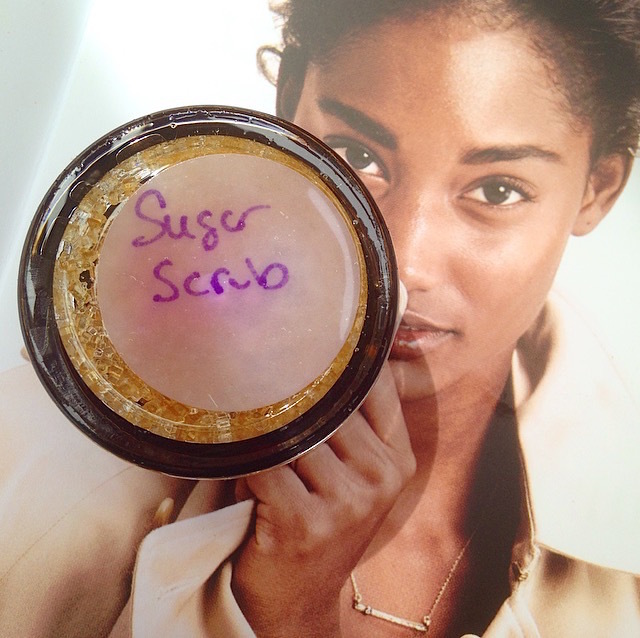 There's actual sugar crystals in a luxurious mixture of nut, seed, citrus and floral oils. These sugar crystals gently scrub and lightly buff your skin, as they dissolve in your warm bath or shower, and the oils leave your skin so soft and silky. The rest of the samples pertain to the face, although one could be used on other areas of the body that are prone to breakouts. How cute is this little square of the Charcoal Cleansing Bar? It's meant to detoxify and absorb impurities from your skin using the benefits of charcoal, without drying it out. The additions of antioxidant-rich green tea and hydrating coconut oil leave your complexion soft and bright. I have to admit that I was a bit hesitant to use this bar at first, but was pleasantly surprised with the results. It is quite gentle and helps to clear up any breakouts. 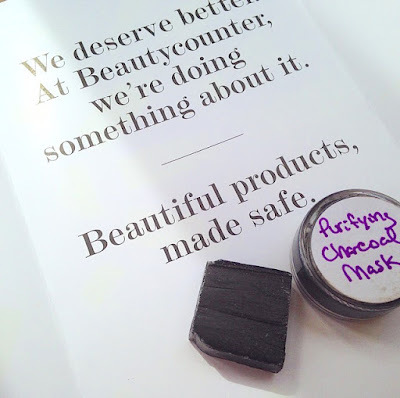 The same is true for the Purifying Charcoal Mask, which I used a couple times to draw out whatever the daily cleanser I was using at the time missed. Koalin clay and charcoal draw everything up to the surface, as this mask dries on your face, and then is easily washed away. I felt as though it tightened my skin and that the refreshing peppermint provided a slight tingle, leaving my complexion with a healthy glow. 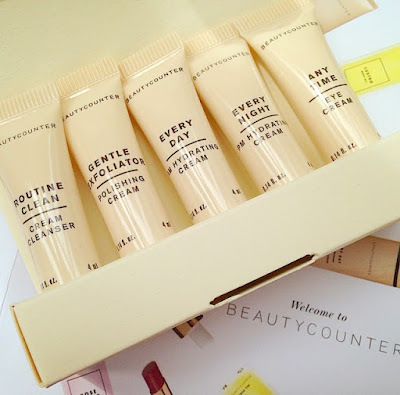 The cleanser I was testing at the time was in this Essentials Sample Set, which comes in this cute set of sample tubes. It's enough product to really get a feel for the products. Here's a better look at what's inside the set. There's the Routine Clean Cream Cleanser, Gentle Exfoliator Polishing Cream, Every Day AM Hydrating Cream, Every Night PM Hydrating Cream and the Any Time Eye Cream (I think this is an older version of the set, so the product packaging and names have been updated). To be honest, using all of these products at once caused my skin to break out a bit, but I decided to continue experimenting with the line. It makes my skin look amazing, balanced and youthful, so it was worth giving it a second chance. From that I discovered, the Routine Clean Cream Cleanser was bit richer than my sensitive, combination skin tends to need, and it didn't give me the deep clean I desired. However, the Gentle Exfoliating Polishing Cream was a nice replacement for the cleanser, as it provided a deeper clean, yet was gentle enough to use daily. I counteracted any breakouts with the occasional use of the charcoal bar and mask. I also applied the hydrating creams very lightly with just my fingertips, so my skin could breathe better. 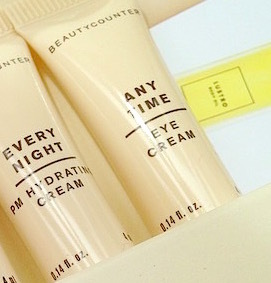 I will say that I adore the eye cream. It's rich in aloe and coconut oil. The combo of the two, moisturizes, depuffs and softens fine lines around my eyes. It doesn't irritate my eyes, nor does it disturb my makeup. 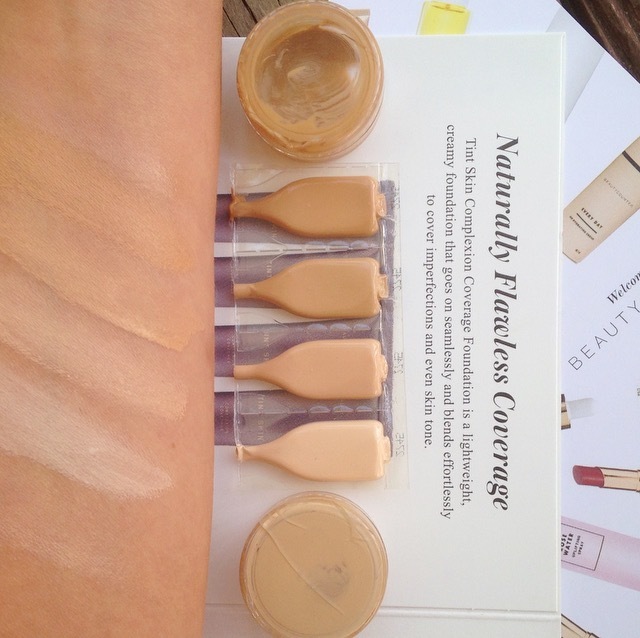 Now that I'm onto the topic of makeup, Theresa sent me some samples of the foundation and tinted moisturizer. Personally, I prefer to keep my makeup light and natural-looking, so I actually requested samples of the Dew Skin Tinted Moisturizer, which is an Allure Magazine 2015 Best of Beauty Award-winner. It certainly lives up to it's reputation, as black currant, peony flower root extract and vitamin C really do help even your skin tone and give you a fresh-faced look. The tint is so light that it's hardly noticeable. It really looks like your skin, only better, and since it is a moisturizer, I found that it worked well as my daily moisturizer, too. The Tint Skin Hydrating Foundation is a bit heavier than the Dew Skin, but is light when it comes to foundation. It provides buildable sheer-to-medium coverage, and just like the Dew Skin, the Tint Skin also improves the look of your skin by smoothing out fine lines and evening skin tone. It's very similar to the Dew Skin, but with more coverage. I like to use it as a light concealer, as needed. 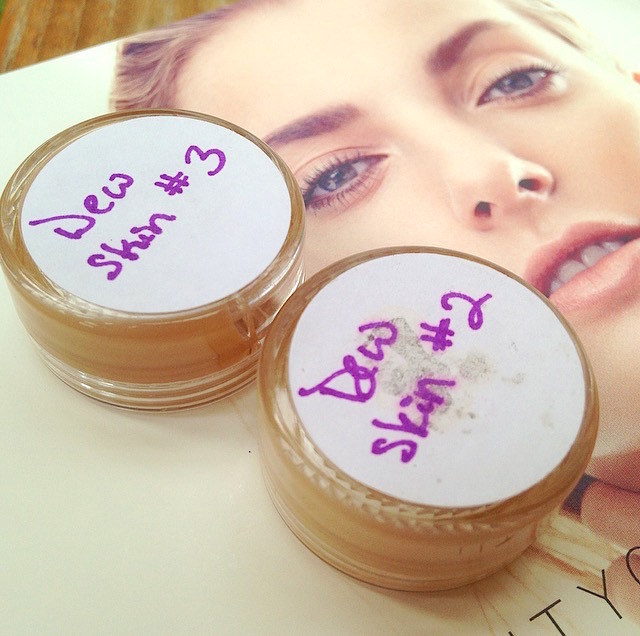 Here are some swatches of the Dew Skin and Tint Skin shades I received. Dew Skin in No. 2 is at the bottom and No. 3 is at the very top. You can barely see No. 2, while No. 3 completely disappears against my skin. You really have to look carefully to see even a hint of this heavily applied swatch. It's a perfect match for me. The Tint Skin shades are the four in the center. 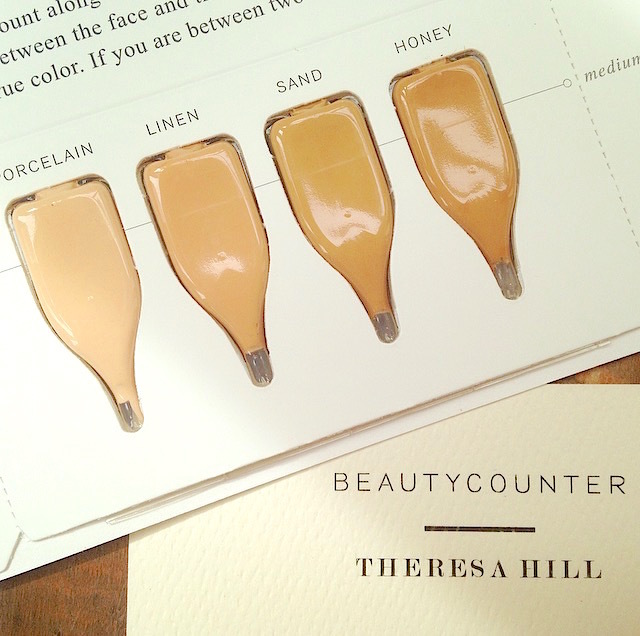 Theresa sent me samples of the light-medium shades, which include from bottom to the top, Porcelain, Linen, Sand and Honey. Sand and Honey seem to work best on my skin at the moment, since I still have a summer glow. Now, I'm anxious to try more of the makeup and hope to find something left at Target this weekend (apparently, it's flying off the shelves). From what I understand, it's only a sampling of the product line and some are available in sets and smaller trial sizes. Beautycounter will only be available at Target for a couple months and then you'll need to find a Beautycounter consultant from which to order more. According to Theresa (looks like you already know where to find a consultant), the products at Target will come with a gift with purchase code that you can redeem on her page. 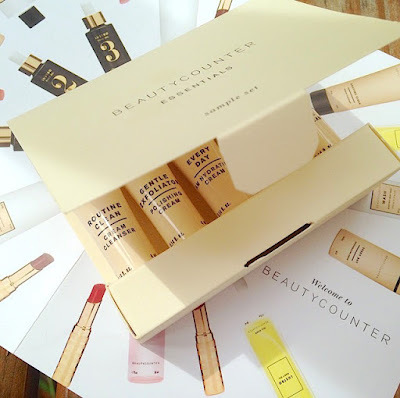 Let me know if you try Beautycounter and if you get any of the sets from Target. You can find me on Twitter at @Rawdorable and/or Instagram (also @Rawdorable). for me to try, all opinions are my own.